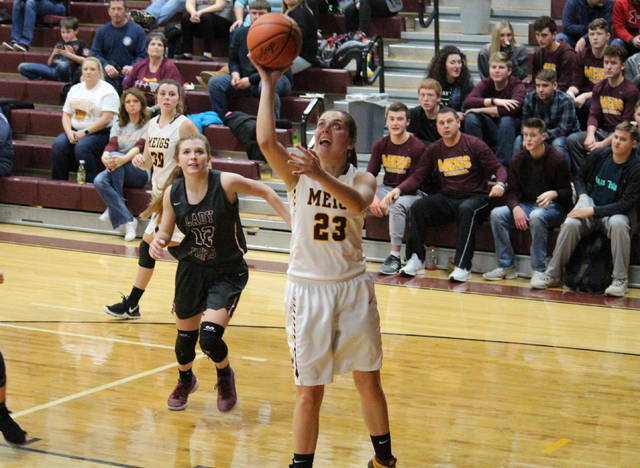 Meigs freshman Mallory Hawley (center) drives to the basket against a Vinton County defender, during the Lady Marauders’ nine-point setback on Monday in Rocksprings, Ohio. MHS senior Taylor Swartz (left) goes in for a layup in front of a Lady Viking, during Vinton County’s 47-38 victory on Monday in Rocksprings, Ohio. ROCKSPRINGS, Ohio — After a long layoff, the shots just weren’t falling. 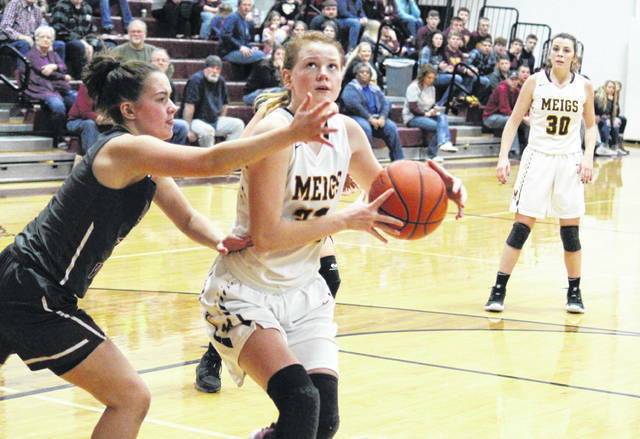 Playing for the first time since Dec. 29, the Meigs girls basketball team hit just 20 percent of its field goal attempts on Monday inside Larry R. Morrison Gymnasium, allowing Tri-Valley Conference Ohio Division guest Vinton County to stay perfect with a 47-38 victory. Meigs (9-5, 4-3 TVC Ohio) never led in the contest, tying the game at 2-2, but trailing 12-8 by the end of the first quarter. Vinton County (13-0, 6-0) began the second quarter with an 11-to-2 run, and led 23-10 with four minutes left in the half. Neither team made a field goal over the remainder of the half, with the Lady Marauders going on a 7-to-2 run on free throws to cut the VCHS lead to 25-17 at halftime. After a bucket by each side in the opening minute of the second half, the defenses took over for the next two minutes. Out of the offensive cold spell, the Lady Marauders went on a 7-to-4 run, trimming the VCHS lead to 31-26 with 40 seconds left in the third. Vinton County, however, hit back-to-back shots to end the third quarter and then made the opening bucket of the fourth, stretching the margin to double digits, at 37-26. After coming up empty on their first dozen three-point tries, the Lady Marauders sank a pair of trifectas as part of an 8-to-4 run, that cut the VCHS lead to 41-34 with 3:55 left in the game. The hosts were held off the board of the next 1:20, however, as Vinton County extended its advantage back to 11. 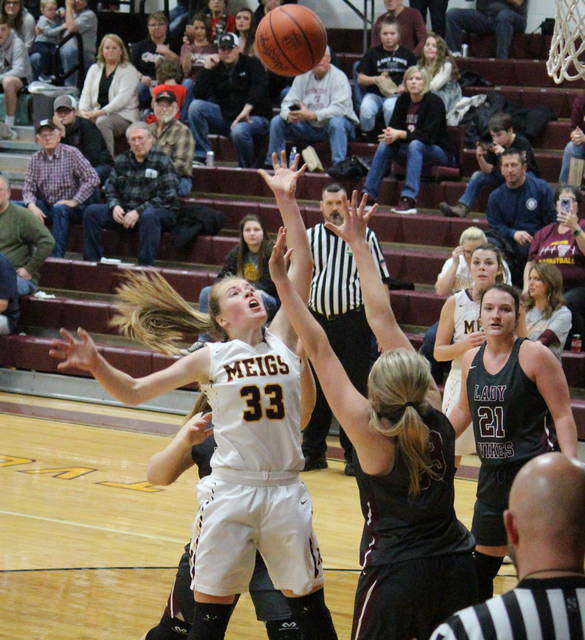 Meigs made it back to within seven, at 45-38, with 1:27 to play, but failed to score again, and the guests sealed the 47-38 win. Following the setback, MHS head coach Jarrod Kasun acknowledged the long layoff and commended his team for staying in the game despite not shooting well. “We worked hard over our break,” Kasun said. “We’re coming off of a two-week break, that’s not always optimal, we conditioned ourselves, we just didn’t shoot the ball well. They’re a very good team, they have a lot of length, they have very good players, if we could have just had a couple more shots fall. We were always in the game, that’s a testament to our kids that we were never out of the game even as bad as we shot it. For the game, Meigs was 10-of-50 (20 percent) from the field, including 2-of-17 (11.7 percent) from three-point range. Meanwhile, Vinton County made 15-of-46 (32.6 percent) field goal tries, including 2-of-14 (14.3 percent) three-point attempts. At the free throw line, MHS was 16-of-21 (76.2 percent) and VCHS was 15-of-19 (78.9 percent). 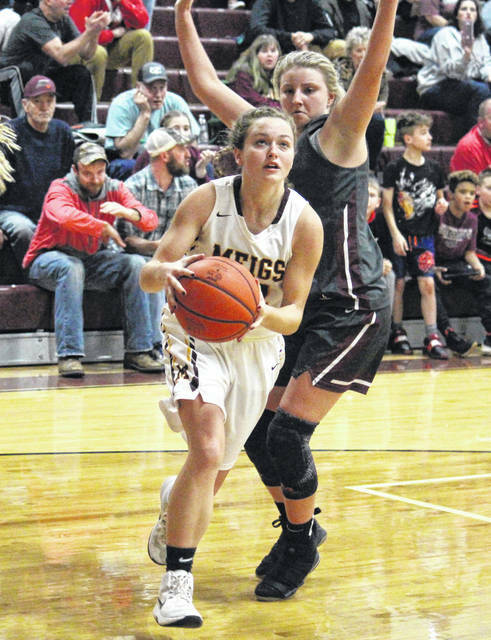 The Lady Vikings won the rebounding battle by a 42-to-25 count, including 11-to-9 on the offensive end, but committed 17 turnovers, seven more than Meigs. The Lady Marauders combined for seven steals, seven assists and three rejections, while VCHS ended with eight steals and eight assists. The hosts were led by Kassidy Betzing with 14 points and three assists, with a 12-of-13 performance from the foul line. Mallory Hawley — who paced the MHS defense with two steals and two blocked shots — recorded a double-double of 13 points and 10 rebounds for the hosts. Taylor Swartz contributed four points and nine rebounds to the Lady Marauder cause, Becca Pullins chipped in with three points, while Marissa Noble and Madison Fields added two points apiece. The Lady Vikings were led by Morgan Bentley with 15 points and 14 rebounds. Tegan Bartoe and Josie Ousley scored 14 and 13 points respectively in the win, with Ousley earning a game-best four steals. Rylee Ousley had three points for the guests, Lacie Williams came up with two markers, while Cameron Zinn had a team-best three assists. This completes the season sweep for Vinton County, which defeated MHS by a 67-63 on Dec. 3 in McArthur. The four-point margin is tied for of the Lady Vikings’ closest margin of victory this season. The Maroon and Gold will look to bounce back at Nelsonville-York on Thursday.